Birkbeck College writes in strong support of the changes Camden has made in traffic flows on Tavistock and Torrington Place. The new traffic flow is much safer and more pleasant for pedestrians and cyclists and has cut down considerably on traffic in and around Torrington Square. The previous arrangement of a single two-way cycle lane with two-way motor vehicle traffic was very dangerous for cyclists and pedestrians, and unpleasant and unpredictable fro drivers. The congestion along this stretch of road had become extreme over the lat years, raising concerns about health and wellbeing of our staff and students especially with pollution from exhaust, noise and safety concerns. As one of the largest employers in Bloomsbury, we wholeheartedly encourage the Council to make the changes to traffic flow along Tavistock and Torrington Place permanent. We thank you for making these positive changes which are to be strongly commended, and encourage Camden to continue making roads in the borough safer, healthier and more environmentally sustainable. We are writing in support of the recent trial cycle lanes along Torrington Place, Gordon Square and Tavistock Place. Feilden Clegg Bradley Studios is a pre-eminent and award winning UK architectural practice. Our London office has been based in Fitzrovia for almost two decades. Our office is growing. Many of our 80-strong London staff cycle to work. A significant proportion of our very large network of clients, project collaborators, consultants and suppliers also travel to our office by bicycle. As we are located at the western endpoint of Torrington Place, a sizeable portion of these use the cycle route in question to travel to and from our office. An even larger proportion of our team would cycle to the office if they felt comfortable and safe on the roads. We value their safety and we want to promote active lifestyles for all our employees. We support their freedom to choose how they get to work. We would like our clients, collaborators, consultants and suppliers feel encouraged to visit our offices by bike. The excellent provision for cycling in the Torrington Place / Gordon Square / Tavistock Place trial matters a lot to all of us who use it. It enables us to get around easily – and most importantly safely. It is definitely one of the attractions of the neighbourhood to us. We value the many safety improvements incorporated in the Torrington Place / Gordon Square / Tavistock Place trial scheme, and as such it makes our offices a more attractive place to visit by our staff, clients, collaborators and suppliers, whether they be cycling or travelling on foot. We believe the scheme will also help to make London a more attractive city in which to build and run our business. I am writing to you, as Head of HR at Engine, to express our companies’ support for the continuation of the new Tavistock/Torrington Place cycle scheme. Engine is a marketing services network with offices in the UK, Europe, China, and America. We first formed in London in 2005. Our 800 London staff have been based in Fitzrovia on Great Portland Street since 2008. We have a very strong culture of cycling at Engine. Over 180 people have taken part in our cycle to work scheme and we provide secure parking for over 150 cyclists every day, as well as showers and changing facilities. Many of our cyclists use the route along Tavistock/Torrington Place to get to and from our office. The improved safety of the new scheme is very valuable to us. Better, safer cycling infrastructure leads to higher take up of cycling, which has two major benefits to us as an employer. Firstly it improves the health and well-being of our employees. Secondly, improved cycling infrastructure and the provision of facilities and related benefits helps us attract and retain the talent that we depend on to thrive and grow. 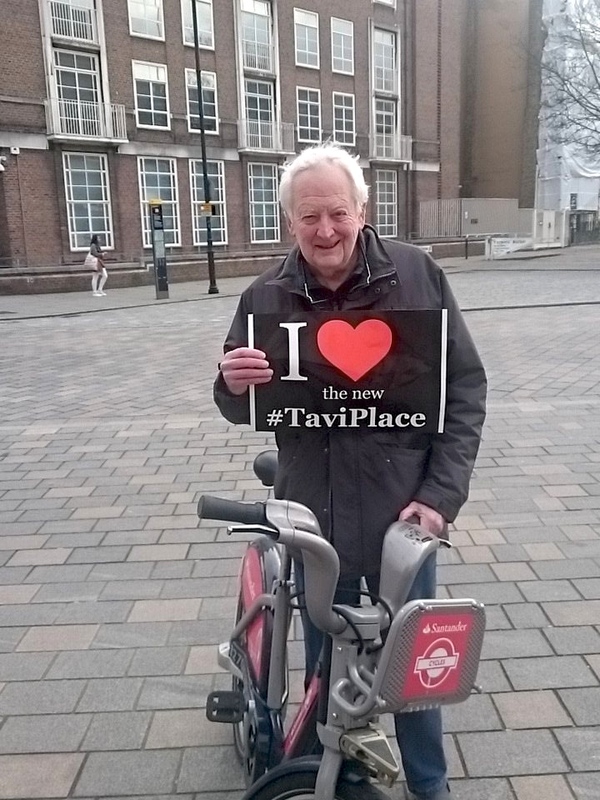 Cycling is good for our business and good for London and we believe that the Tavistock/Torrington Place scheme is too. Please give strong support to the continuation of the scheme and making it a permanent feature of our neighbourhood. Farrell + Clark Architects have been based in the Borough of Camden now for 7 years with a lease for many more. One of the key reasons for choosing to locate our office in this Borough was for its public transport links and commitment to improving the provisions for cycling. The Tavistock/Torrington Place scheme now directly links our office to the main train stations at Kings Cross and Euston. As an architectural practice with a core belief in sustainable development we also try ourselves to keep our own carbon footprint on the planet as small as possible. This includes encouraging and supporting those of us who wish to cycle to the office. Our research has shown that the biggest obstacle is the belief that cycling is not safe in London. The excellent provision now for cycling in the Tavistock/Torrington Place trial is definitely one of the attractions of the neighbourhood to us, and feedback from those of us here who use it already is overwhelmingly positive, and most important improving safety for all road users and pedestrians. The excellent provision for cycling from the main stations to our office via the Tavistock/Torrington Place trial scheme will help us to attract and retain the employees our business needs to continue to thrive. They will also make London a more attractive city in which to build and run our business. I am writing on behalf of SOAS University of London to express support for the new road arrangements on Tavistock Place and Torrington Place. The changes to Tavistock Place and Torrington Place cycle lanes are currently providing a safer means of cycling to and from the campus, as well as creating a more pedestrian-friendly environment. SOAS is a major institution in the Borough of Camden, with more than 5,000 students and 1000 staff members. A large number of our community chooses to cycle to campus. In a survey we conducted last year, [https://www.soas.ac.uk/news/newsitem102156.html] we learned that more would cycle if they were improvements in cycling provision. We recognise that the scheme also has wider benefits such as helping to improve air quality, ensuring the roads are safer for pedestrians to cross, and creating a pleasant environment to work and study. This initiative may also stimulate an impetus to wider road improvements in the environs around our Bloomsbury campus. We will continue to encourage our students and staff to share their feedback with Camden Council to help shape the final layout of this scheme. SOAS welcomes the Tavistock Place and Torrington Place road improvements and is committed to working closely with Camden Council on this and other environmental initiatives. Mavity & Co is a leading creative agency based in Soho and have been running for 5 years provide advertising, pop videos and online content. Like many creative businesses, many of my employees cycle to work and use Tavistock Place to safely commute, myself included. The trial has been a success and has greatly increased the feeling of safety for my employees and myself. This is imperative for a more sustainable London. I truly feel that there are very few safe spaces to people to cycle in London. Personally the only part of my commute that is designated for cyclists is this small run. If councils are serious about reducing the horrific pollution in London, making it safer, and encouraging more people to use bikes this scheme should be made permanent and extended. My business relies on attracting young, creative people. These bands of people are very likely to cycle to work and this scheme helps me attract the brightest and best to my business. Which is good for London too. Please ensure that it is retained. UCL Eastman Dental Institute’s response to the Tavistock Place and Torrington Place cycle lane trial. I am writing in support of the changes to road and pedestrian infrastructure that are undergoing trial on Tavistock Place and Torrington Place. 258 Gray’s Inn Road, London WC1x 8LD.